When it comes to improving the security and protection of corporate applications, many companies yield to the complex passwords that are to be changed frequently. Besides the corporate application passwords, each employee must remember quite a lot of passwords for the mail, websites, current documents, etc. And should an employee forget a password, get sick or quit and not leave passwords to important documents, that often leads to further difficulties and to considerable expenses on recovering the crucial data. 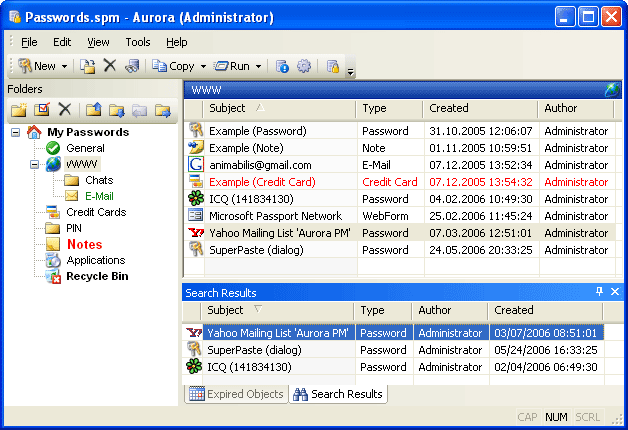 Aurora Password Manager (Animabilis Software) is a full-featured password storage and management solution for Enterprises. This software will store your sensitive data such as website and e-mail passwords, credit card account data, cellular phone PIN codes, etc. in a secure database. The database is encrypted with a 256-bit Advanced Encryption Algorithm, a standard adopted by the U.S. Department of Defense that would take at least 500 years to crack. To increase security even more, the password database can be stored on removable media (such as a USB flash drive) and connected to the computer only when needed. In addition, the program features a completely configurable interface and several visual styles. Aurora Password Manager supports all Windows versions starting with Windows 98.